I took a mini break from blogland over the weekend to concentrate on other things. They say a change is as good as a holiday. That's crap. I didn't feel like I was in a tropical vacation spot. I felt like I was vacationing in Antarctica all the while dreaming of our trip to Hawaii in a few months. This long weekend has been full of sewing and relaxing and other good things. My life needs a good shake up and this was the first part of it. Friday Night I was talking on the phone to Little Miss Sunshine while putting together and sewing a row of my Tumbler quilt. Talking and sewing can often lead to disastrous results as evidenced by this screw up. I'm not unpicking it. This quilt is being put together randomly and the fact I have two identical blocks next to one another just reinforces the randomness of it all. Saturday saw my monthly Farmers Wife group get together at Tazzie's house. It was a lovely afternoon of eating and chatting with Tazz, Claire and Loz and I even did some sewing, although not on my Farmers Wife blocks. In fact not one of us did anything Farmer's Wife related. The likelihood of me finishing that quilt- ever- is so slim that I have publicly started referring to it as my Farmers Wife pot holder. So, I worked on my hexie flower garden quilt and got 4 more flowers done. Since I was on a roll I got another one finished on Saturday night. Tazz has the most gorgeous quilts stashed all over her house but this one took pride of place in her dining room. Its called Nearly Insane. I felt crazy just looking at it so I cant even begin to imagine what it must have been like to actually make it. It's even more gorgeous in person. 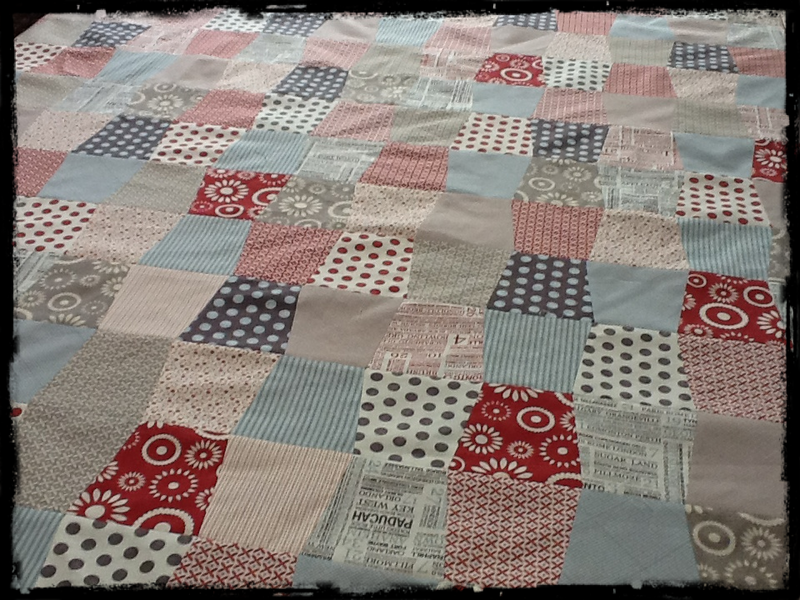 If you want to see what an actual FW quilt looks like nearly finished pop on over to Tazzie's blog. If I didn't like her so much I'd be muttering about classic over achievers. I slept in late Sunday and then spent hunks of the day working on my tumbler quilt while Little Miss Sunshine worked on a quilt of her own. We did this together despite the fact that 2000 kilometres separate us. Facetime Sewing rocks! I'd encourage everyone to do it. And on Monday I worked my backside off to finish the tumbler quilt top. I'm breaking with tradition here and naming my own quilt. It's called "Home on The Range ". It makes me want to go out and square dance or something. Two more hexie flowers were also completed today but I'm too lazy to take pictures, so you're going to have to imagine them instead. I will get to emails and blog commenting at some point this week- I'm just not sure when ! So in summary, this weekend was spent finishing a front and back for a quilt I started last week (insert round of applause here ) , sewing 7 hexie flowers, gossiping Saturday away and teaching myself to sleep in past 7 am. I'm call that a success. Random is good! Even better, letting it lie. Overthinking things leads nowhere good, to my mind. Glad you continued sewing during your non-vacation. To me, sewing with friends IS a vacation since I never get to do it. Which block is your FW potholder? That quilt really is insane, she's a far better woman than I! I think you might be headind for the over achievers award for long weekends stitching....but I am just jealous! Love the idea of sewing with my Mum (only 900 km away) on FaceTime will have to investigate, thanks for the idea! Loving the tumblers, they look fantastic, as does the back. I would have to unpick that row, I couldn't face looking at two identical blocks next to each other. Sorry that I made you do it and now telling you you should unpick it. Aha now I can see my drawer where I sit! I love Face Time sewing, although now you know how much I swear when I've sewn a seam incorrectly and have to unpick it. Yeah for relaxing and productive weekends! Love your hexies. I want to face time sew! I want to face time sew! 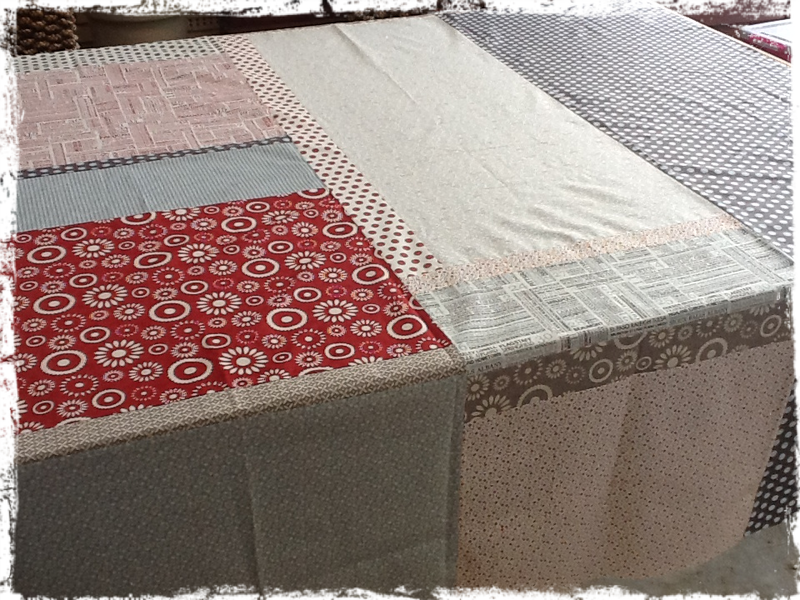 Your quilt is perfect in it's imperfect state! I am sure others will not notice it. I am just as sure that your eye will go straight to the double block section! We are always so hard on ourselves. You sound like you got your mojo back! I am so happy for you. Of course, I am also upset, because I think you stole mine! By the way, please say hello to Marg for me and send her my love. I hope the sale of her house is going well. 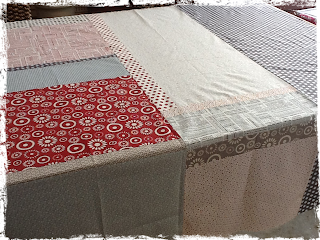 I had a finish this weekend, currently putting the binding on Xmas in July quilt but can't show any pictures :(. Have't tried FaceTime on my iPad yet, that would be a bit scary. Squid does it all the time, have to be careful about screaming like a banshee sometimes just in case she is talking to a friend. By the way love the quilt. Home on the Range ~ perfect name! It does remind me of square dancing. HA! Looks like a fun quilt to make. When I first read your post I thought I saw the Miss P was working on a quilt .. did I imagine that? How fun to spend face time quilting. I haven't done that, yet .. so many new things to try. The quilt looks great! Sounds like a wonderful Saturday too with quillty friends even if you didn't work on the Farmer's Wife blocks. The hexies look great. Wow! You've completed a ton of stuff this year! Way to go. Go you - sure looks like a mini vacation spent in your sewing place and with friends - Fabulous. Lovely quilty things happening there -fantastic to have a front and back completed together, you'll be finished in no time. Hope the short week is good to you. Home on the Range: Love it! Bravo for not unpicking. Random should be random, after all. Let the tumblers fall where they may. I do applaud you for getting so much done, Farmer's Wife stuff notwithstanding. When on is retired like me....everyday is a weekend. You gotta get old to experience it though, so keep working. I love this quilt...very scrappy and no one will notice the two blocks the same...only you! I always heard it "a change is as good as a rest." It has a little different meaning. At the moment, I'd take either a rest or a holiday. I'm not fussy which. Your tumbler quilt is awesome! I love the back, too! And I've seen one of those nearly insane quilts, all finished up. Yep. Nearly insane is the perfect name for it. And those Hexies are so amazing! I love that fabric you picked.